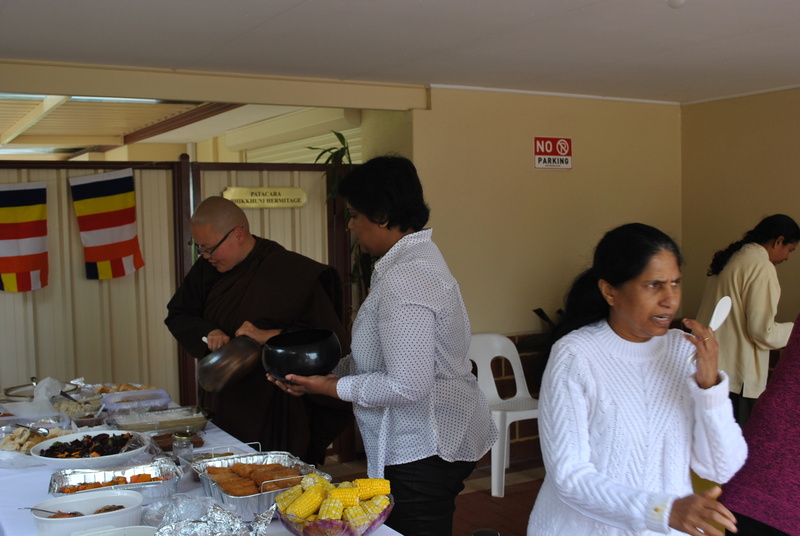 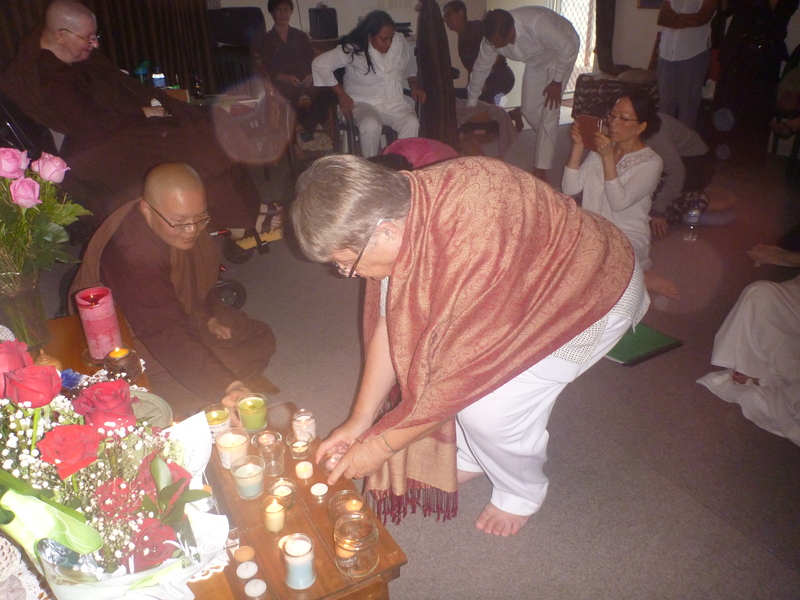 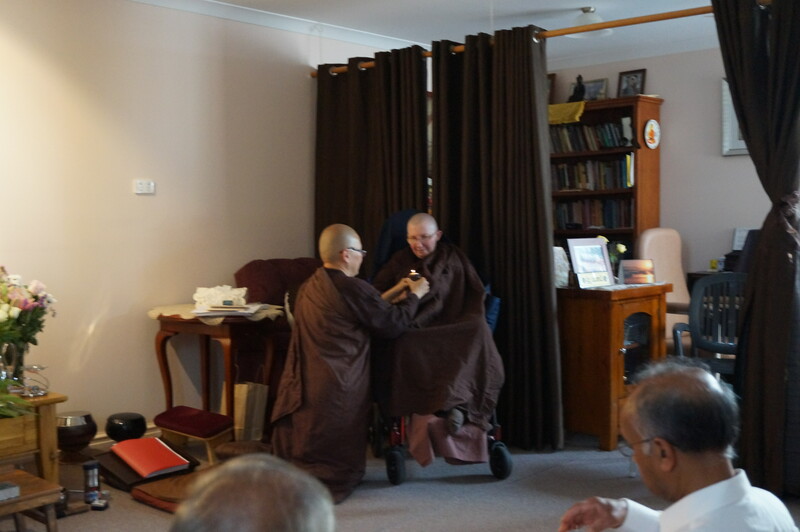 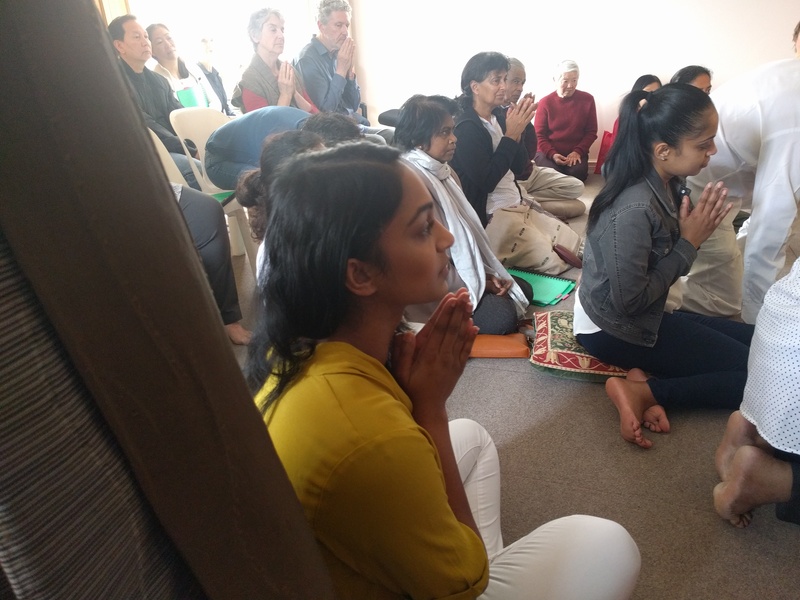 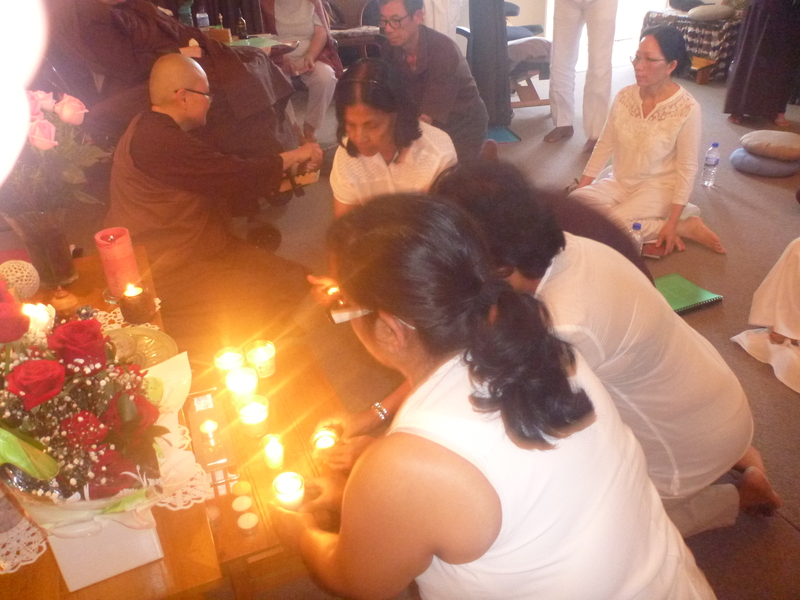 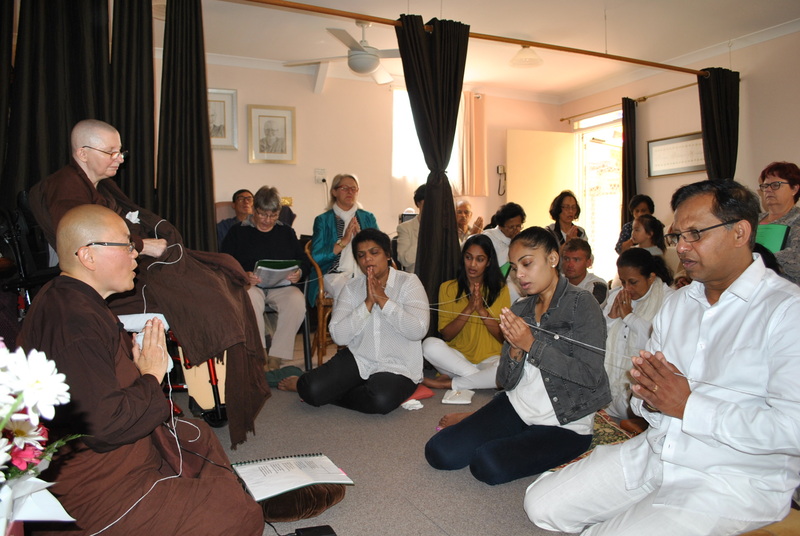 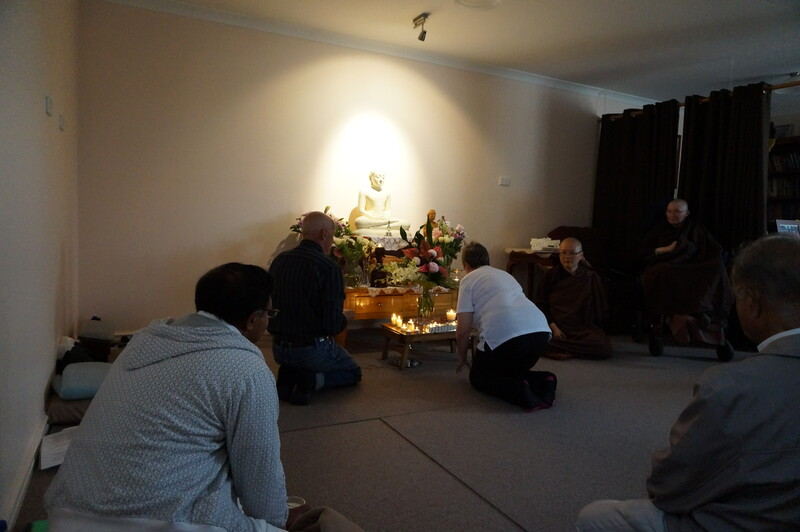 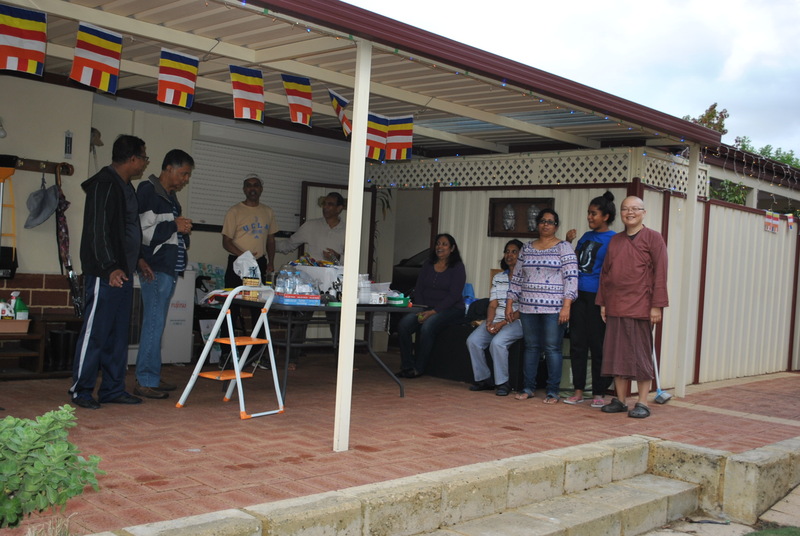 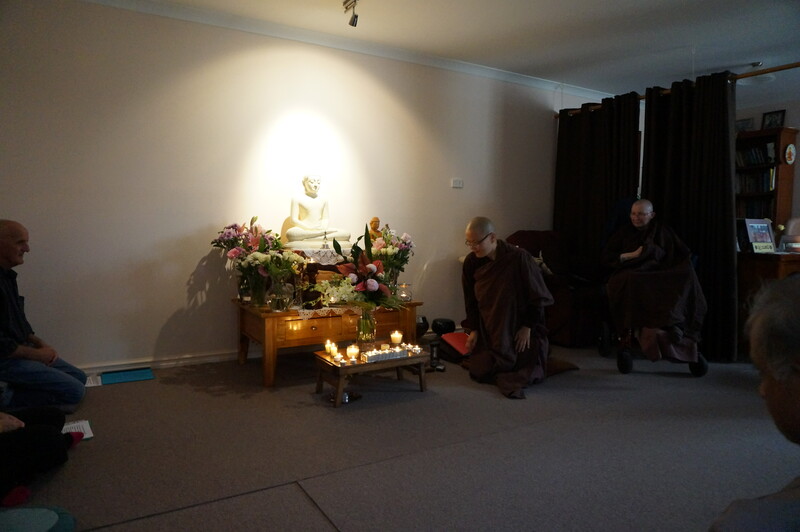 On Sunday 21st October 2018, about 35 supporters participated in an auspicious afternoon at Patacara Bhikkhuni Hermitage to mark the Bhikkhuni Ordination anniversary on 22nd October for Ayya Vayama Bhikkhuni and Ayya Seri Bhikkhuni. 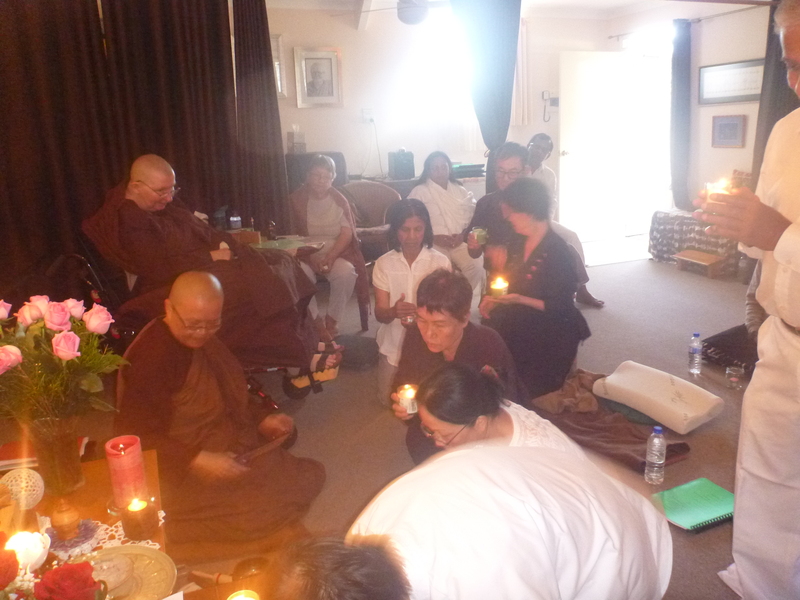 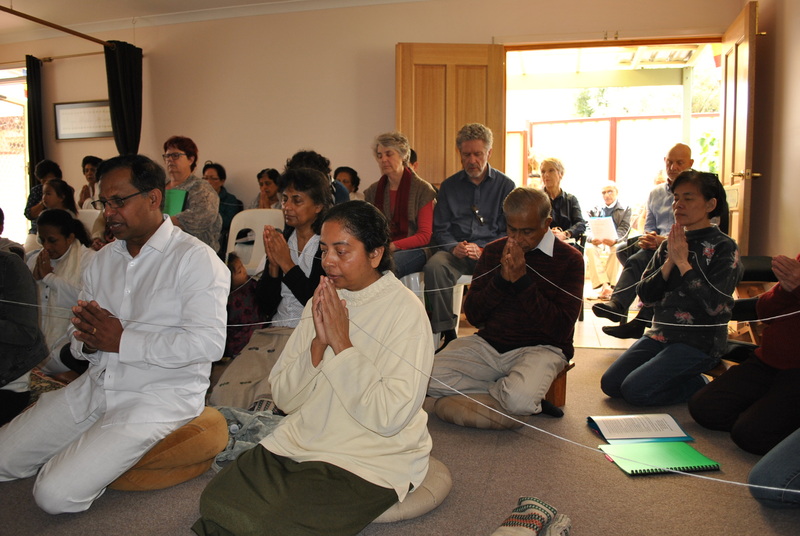 We meditated together and chanted the Paritta . 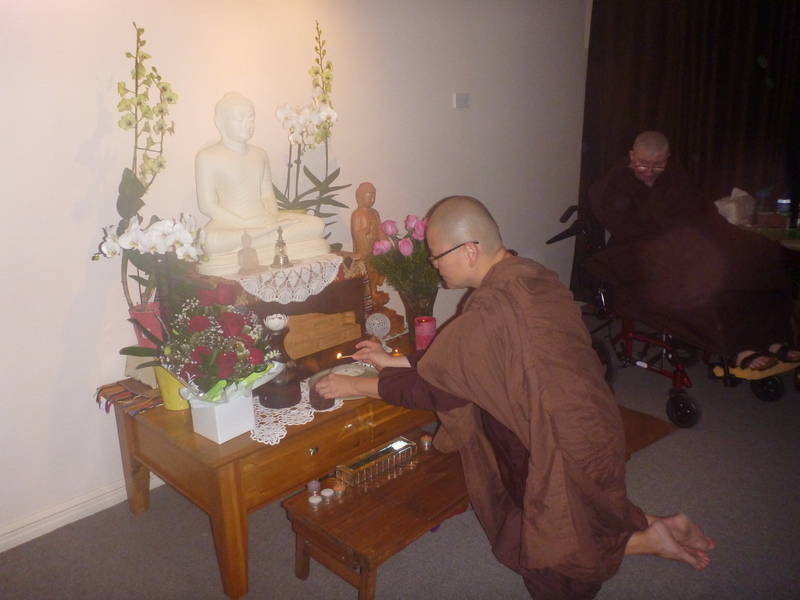 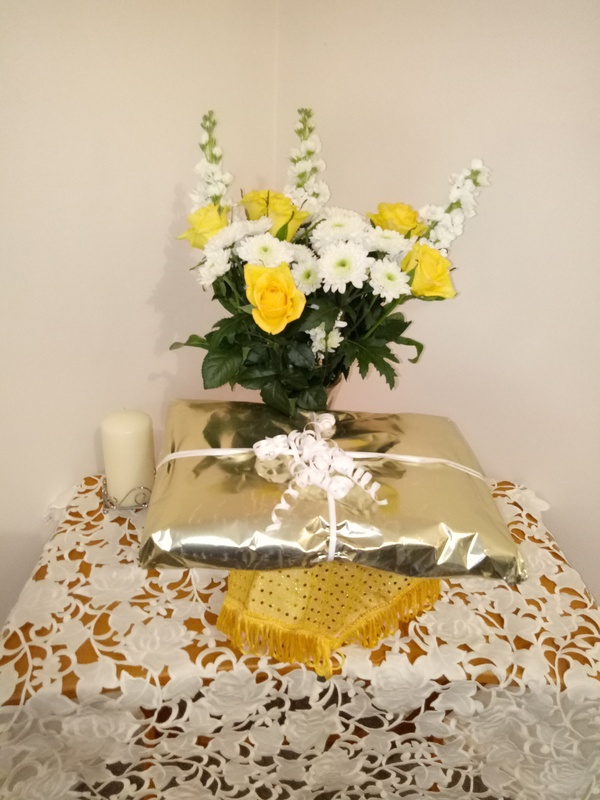 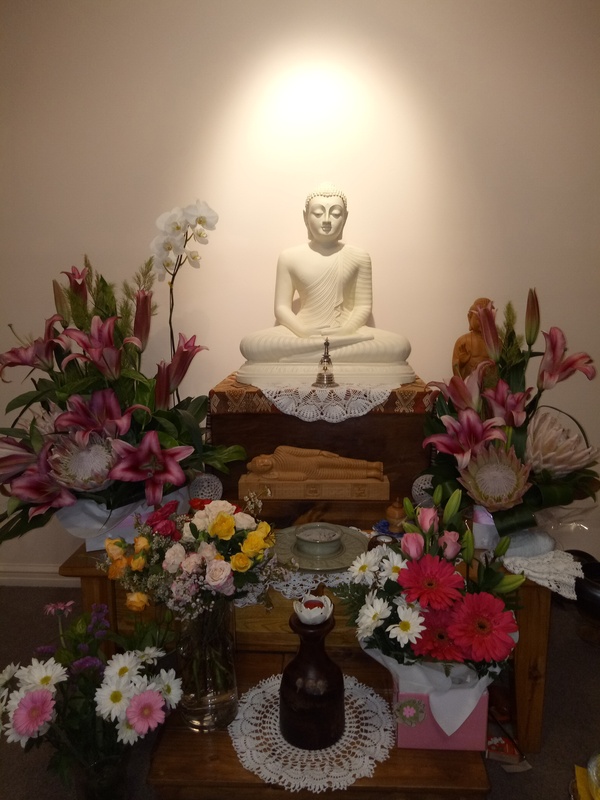 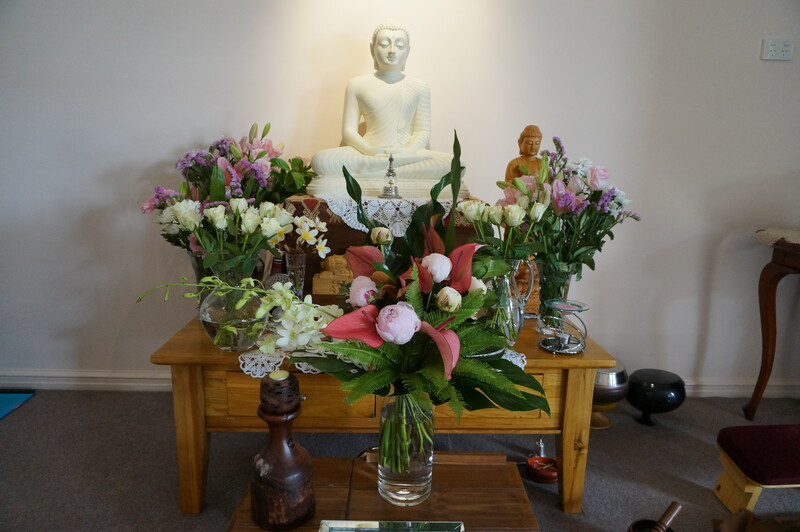 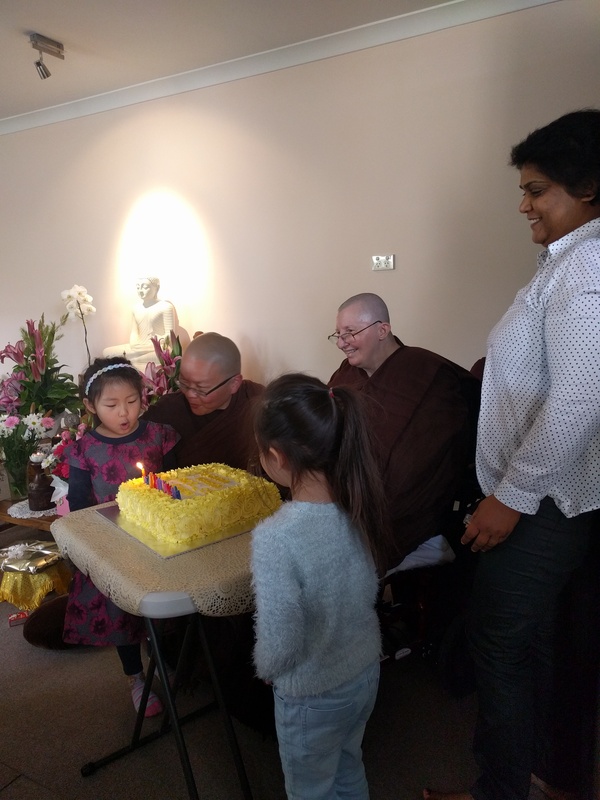 We also included Ayya Vayama Bhikkhuni in the blessings and sending her good wishes and lovingkindness for her birthday on 28th October. 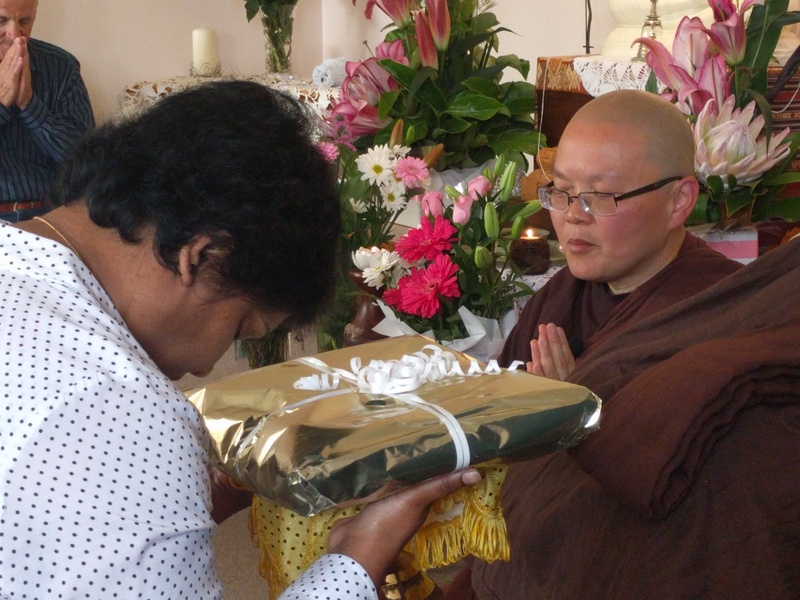 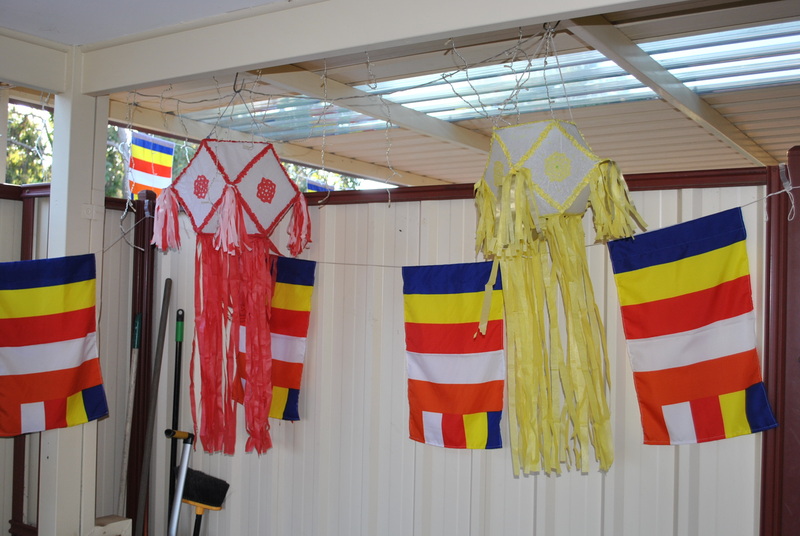 The End of Rains Cloth Offering Ceremony was held on Saturday 28th October 2017 at Patacara Bhikkhuni Hermitage. 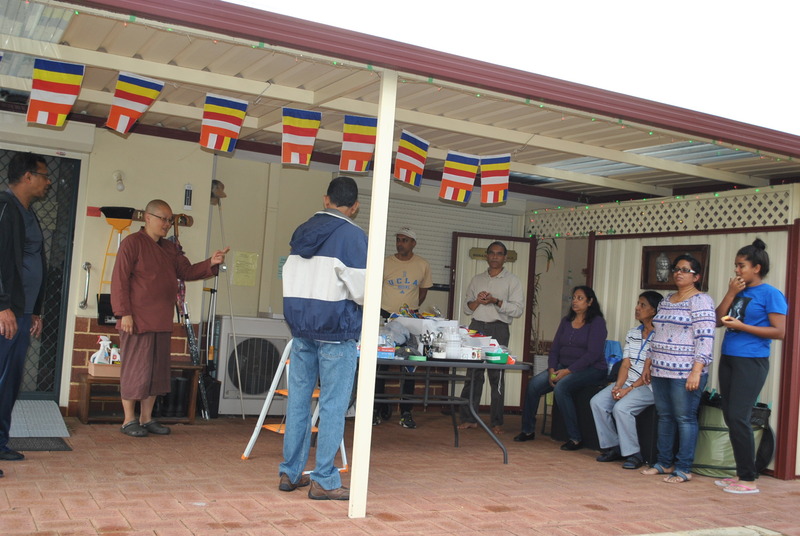 About 45 lay supporters and friends participated in the event. 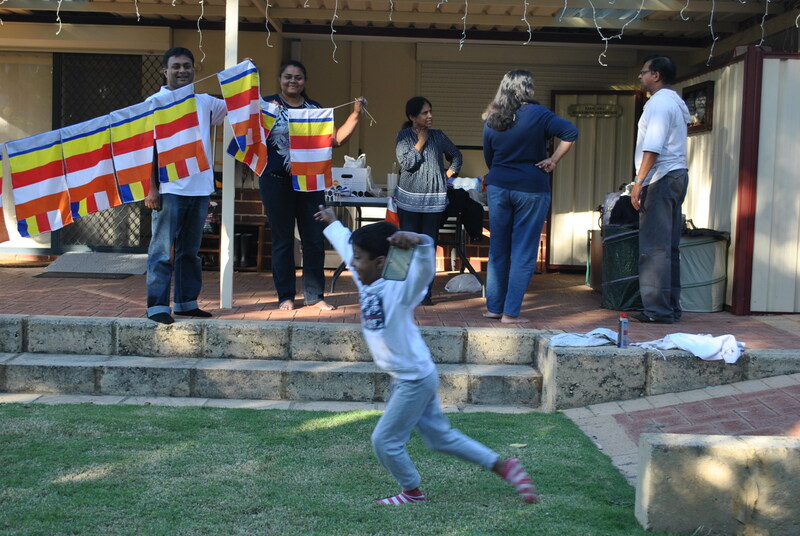 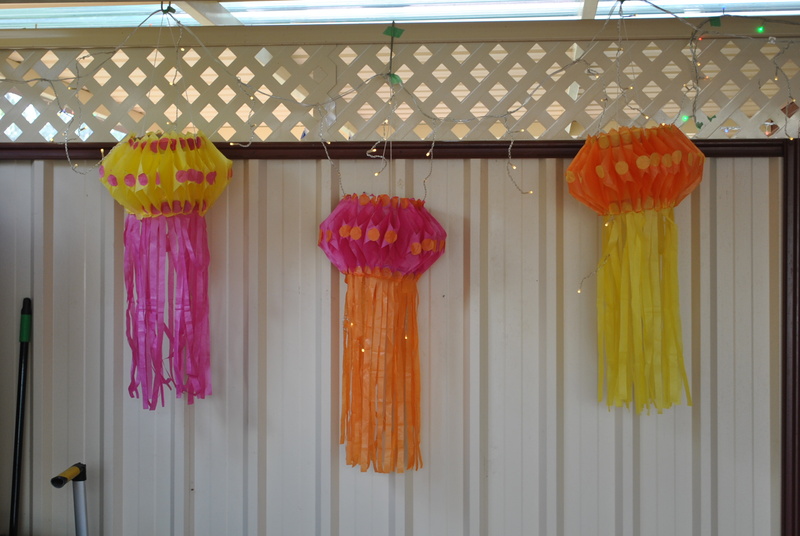 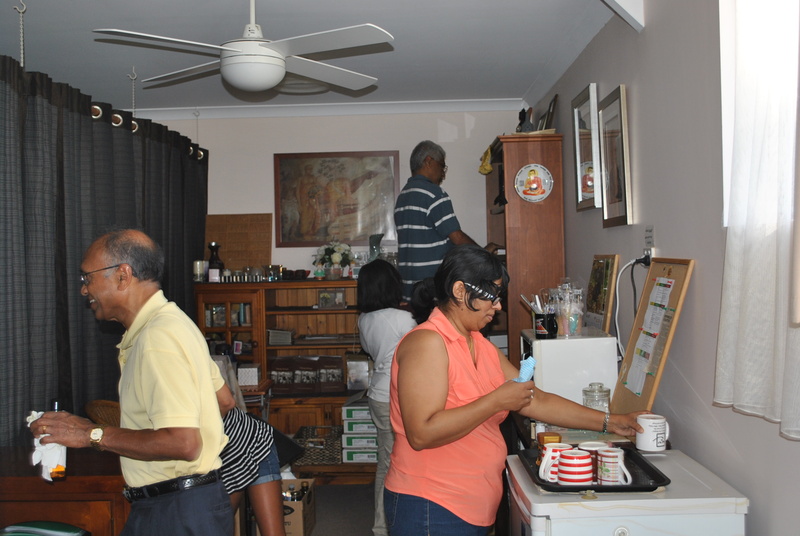 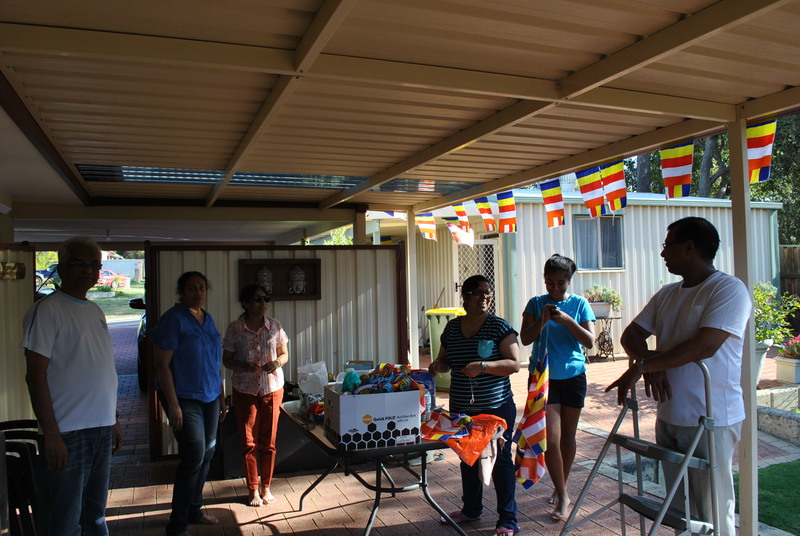 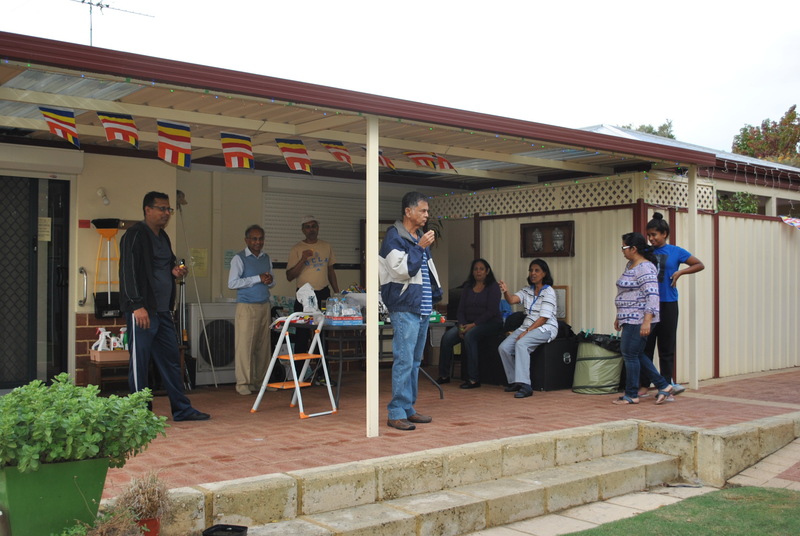 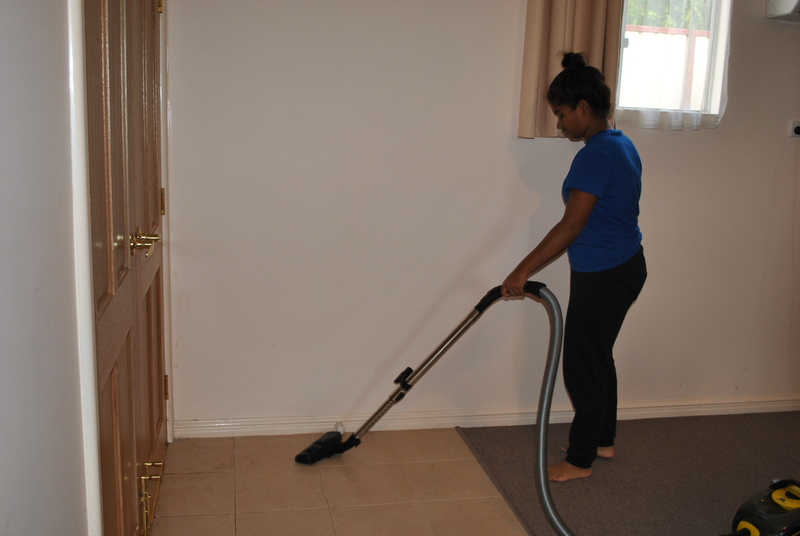 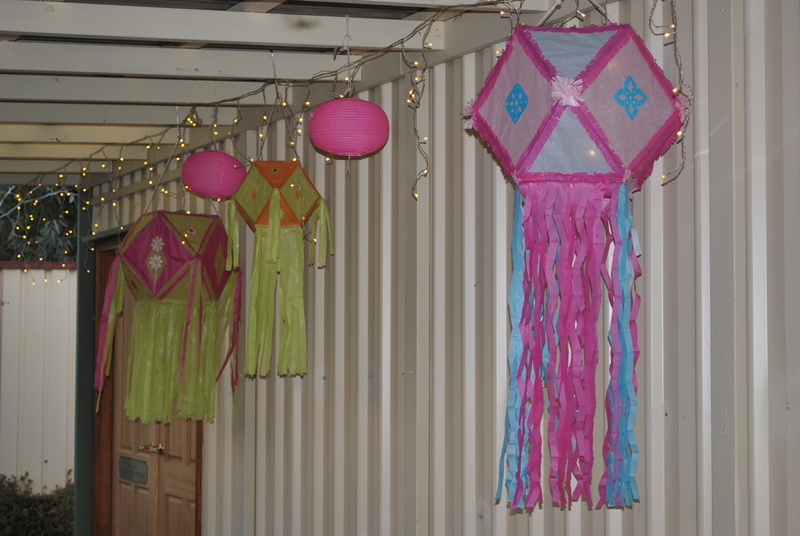 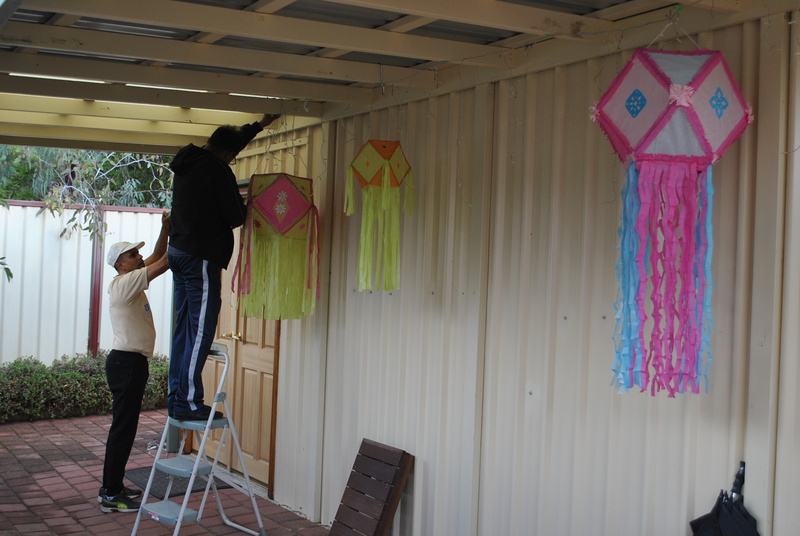 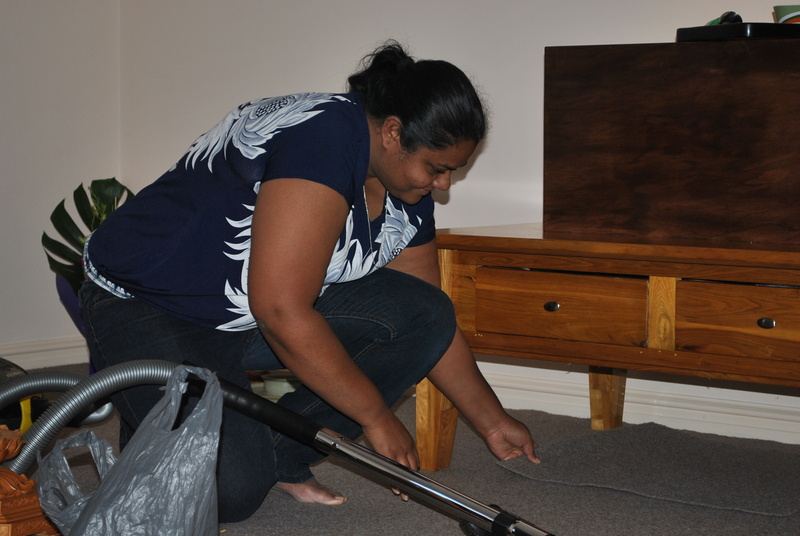 Chandrika Perera offered the End of the Rains Cloth this year. 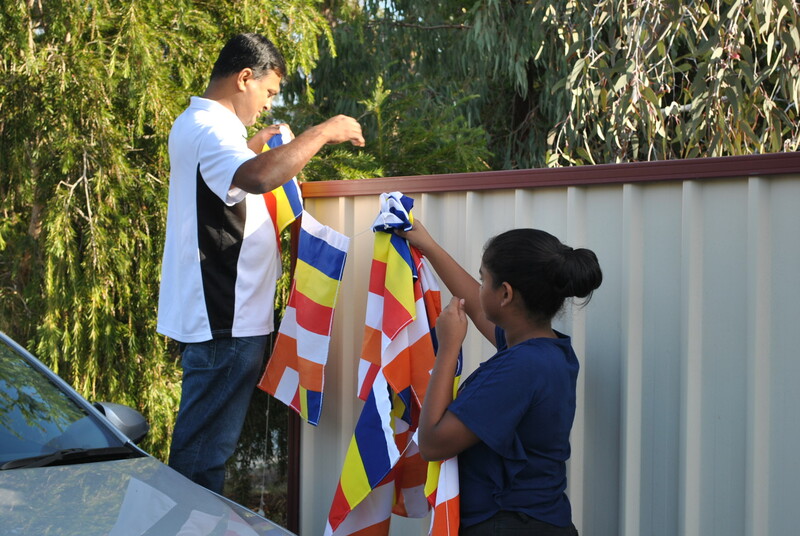 Her family was present to witness the offering of the End of the Rains Cloth. 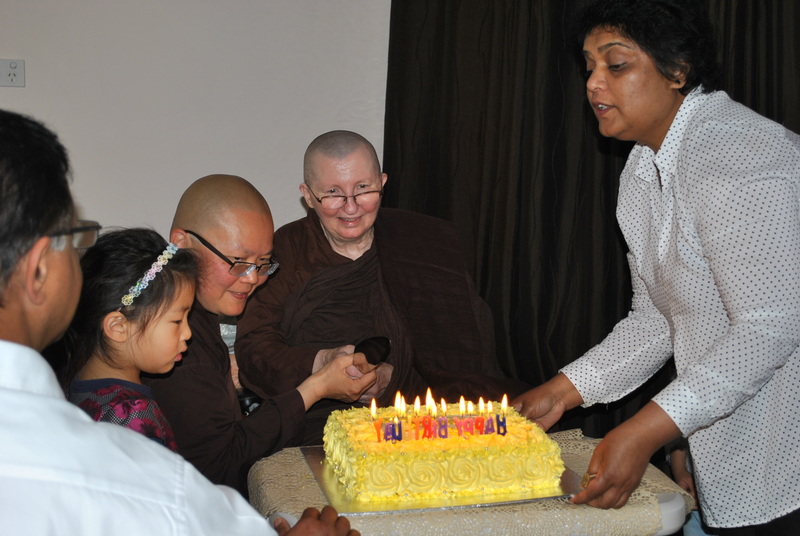 On the evening of 9th June 2017, with the full moon slowly appearing, courageous Chandrika watched with joy and equanimity as Ayya Seri began to cut off her long, beautiful locks of hair . 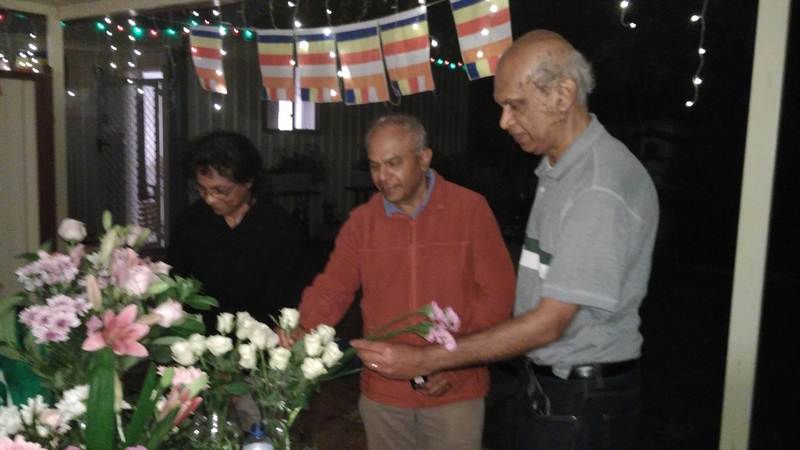 Being the Full-moon Poson Poya Day, (the day which commemorates the introduction of Buddhism to Sri Lanka by Arahat Maha Mahinda, son of King Asoka of India, in the third century BC), the Head Shaving Ceremony had more significance. 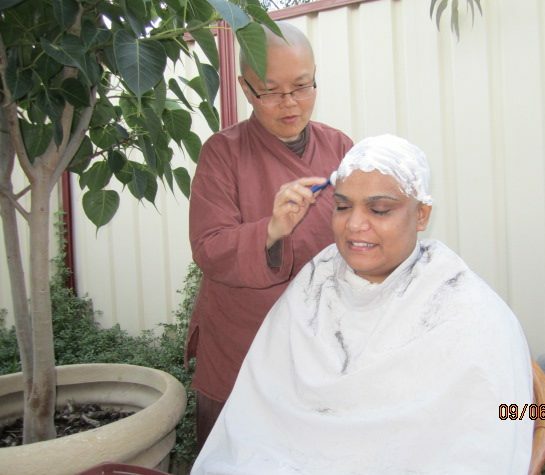 When Ayya Seri cut off the first lock of hair, she gave it back to Chandrika and she asked her to contemplate and reflect on why she was doing it. 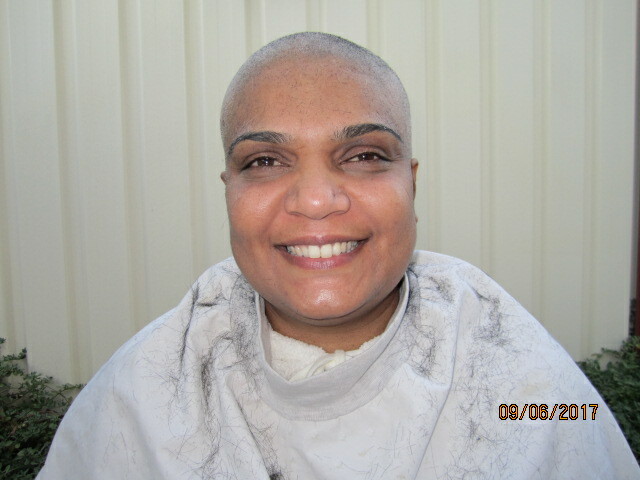 With her supportive husband Mohan behind her Head Shaving, Chandrika’s delightful eyes were filled with tears of joy as her head was shaven clean. 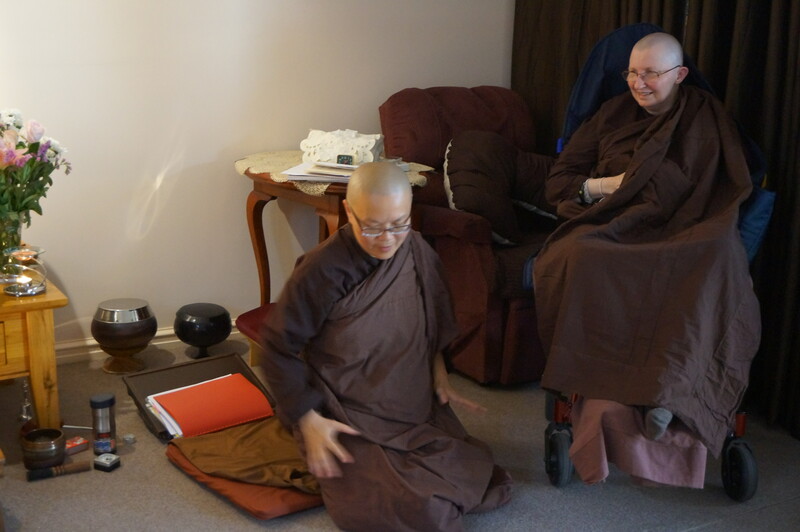 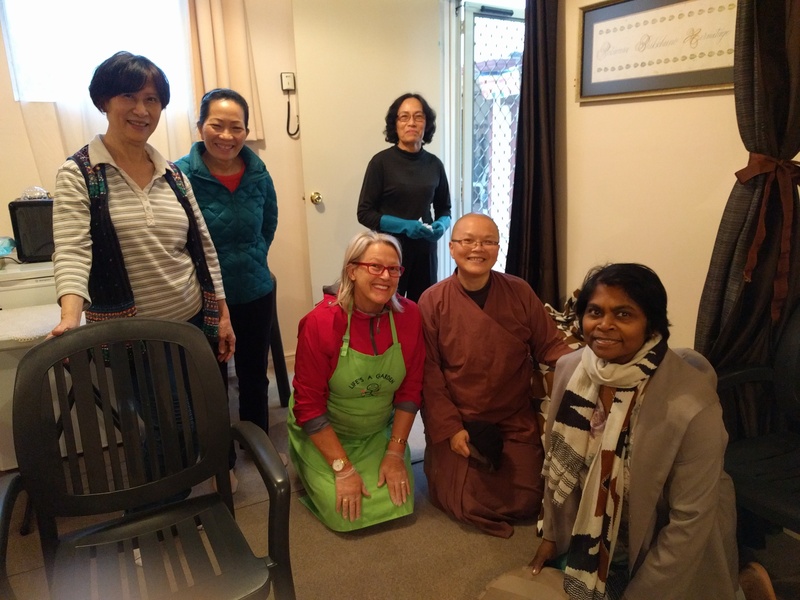 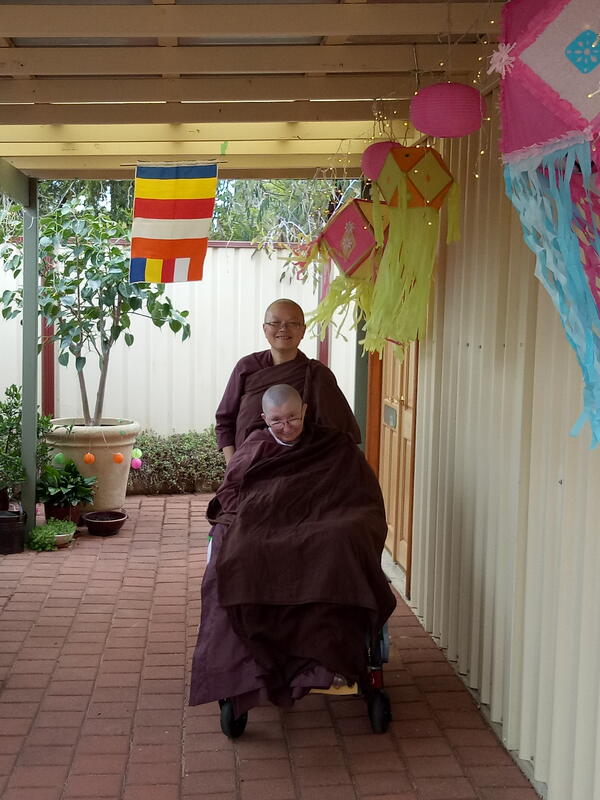 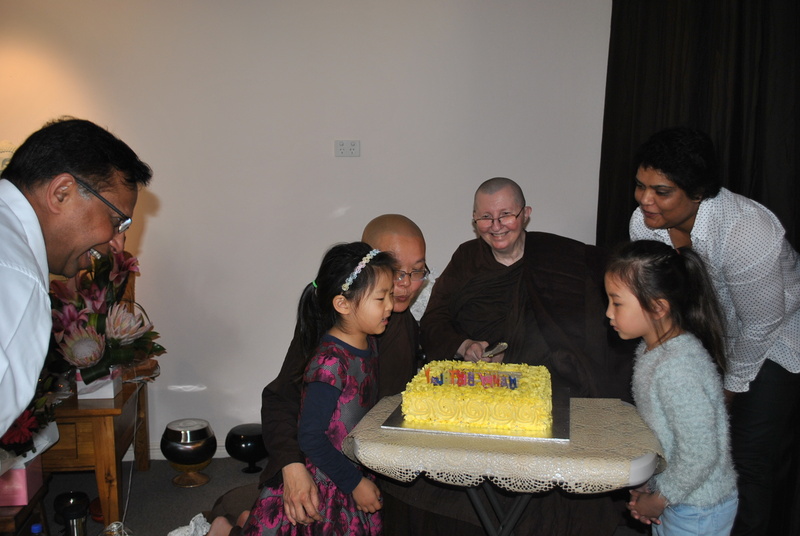 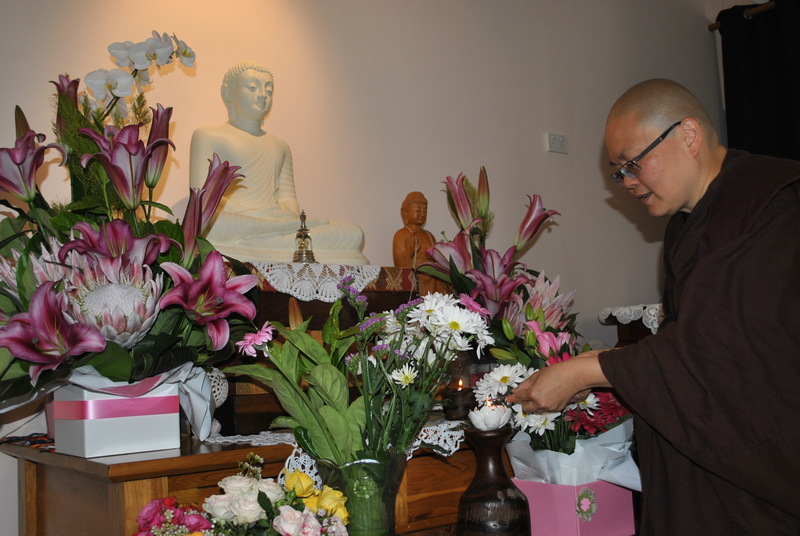 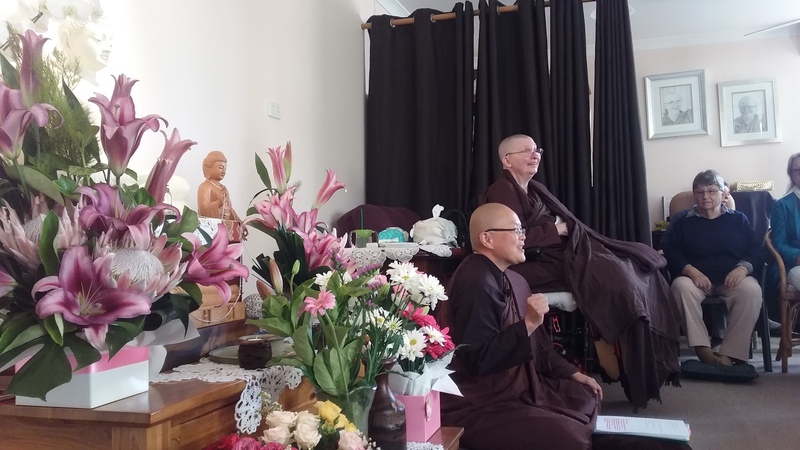 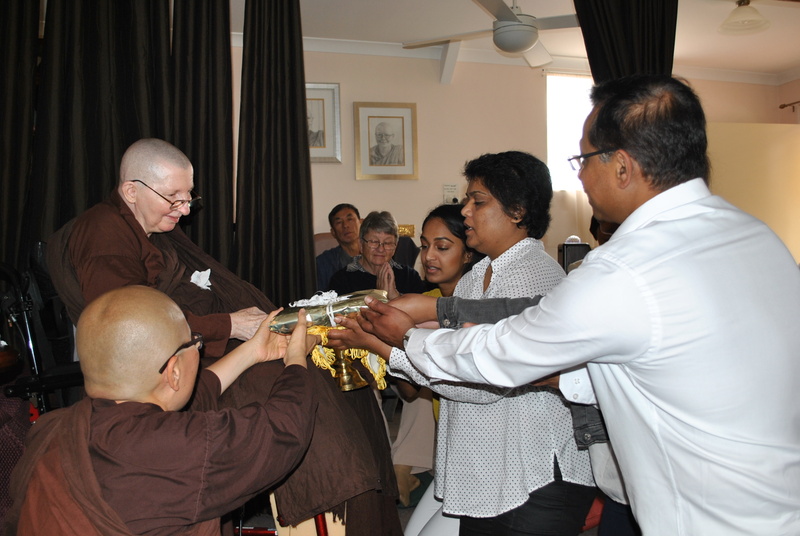 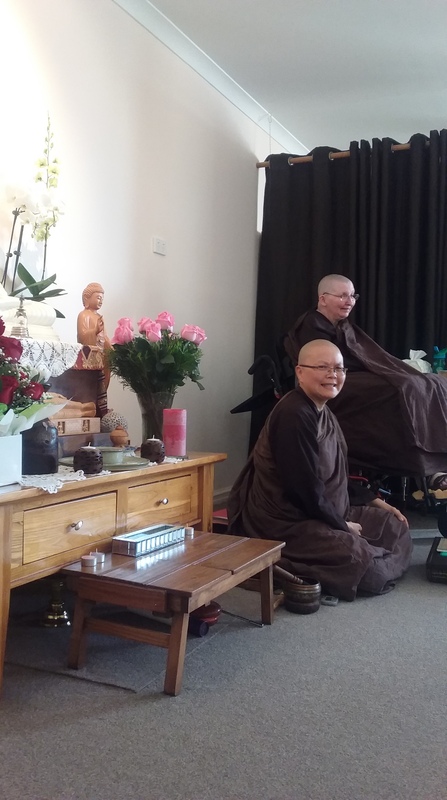 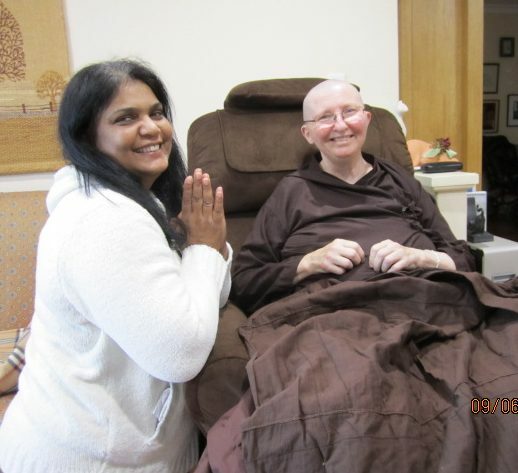 Her “Hair For Care” intention to raise funds for Ajahn Vayama’s Care was so sincere and spontaneous, that she felt so much joy doing this meritorious deed. 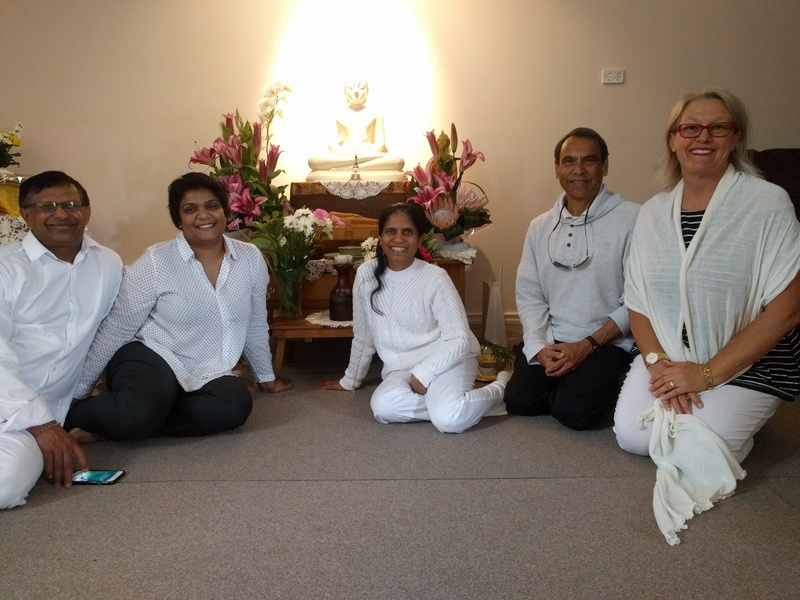 At the end of the Head Shaving ceremony, performed so dexterously by Ayya Seri, stood a beautiful being … all in white with a countenance radiating peace and joy! 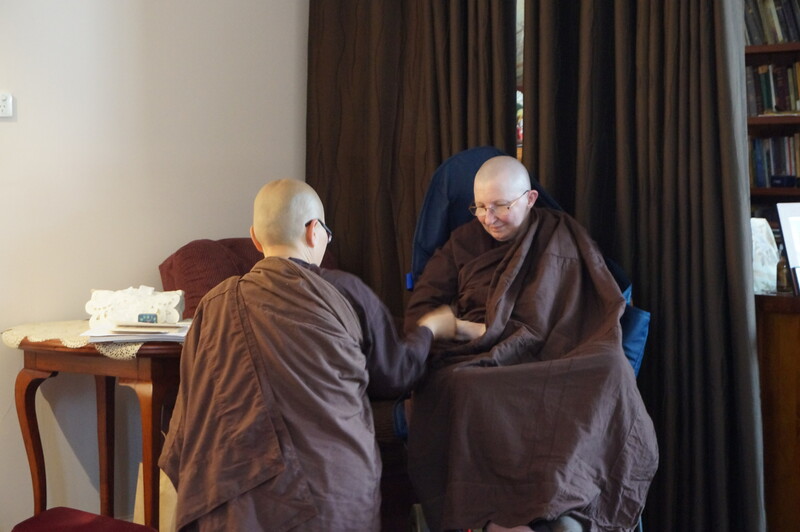 Thank you for inviting me to support the brave and wonderful thing that Chandrika has undertaken to do for Ajahn Vayama’s ongoing care. 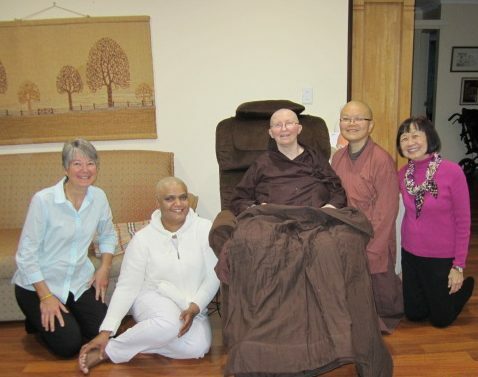 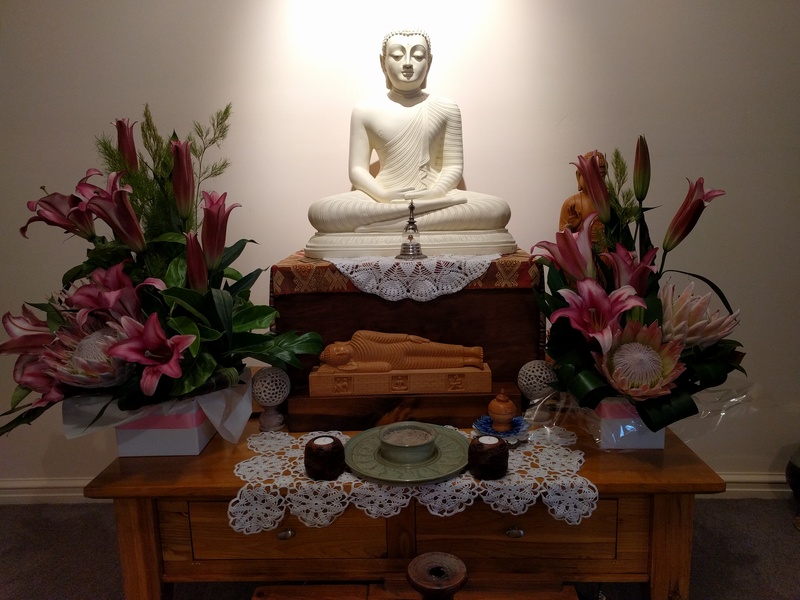 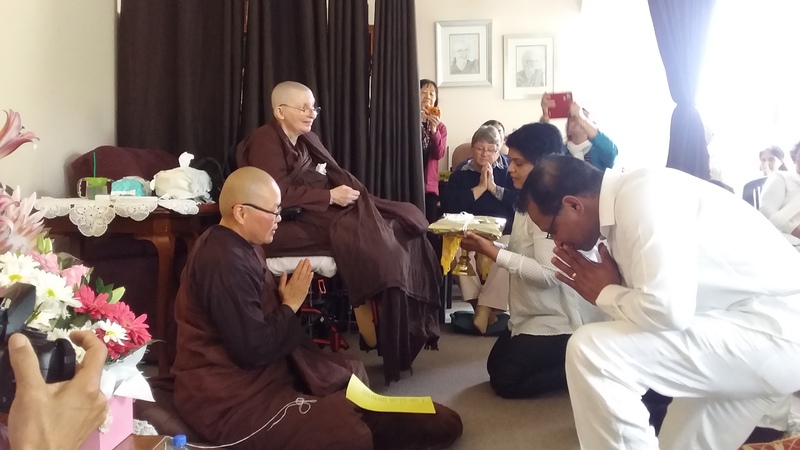 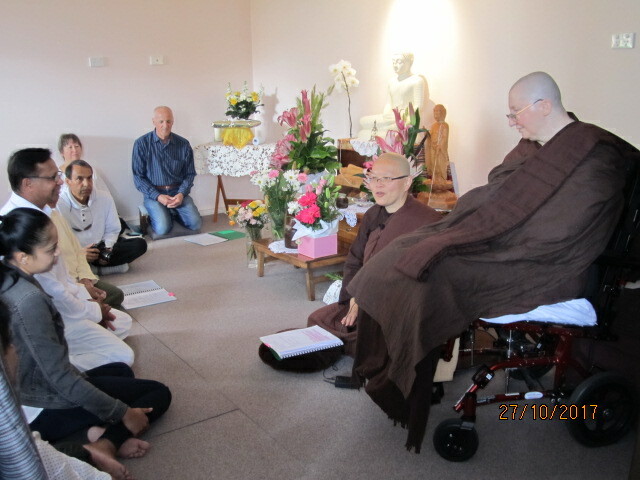 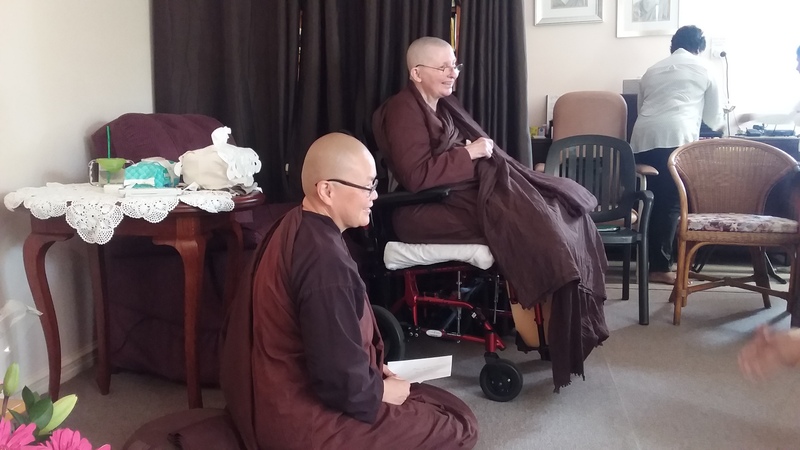 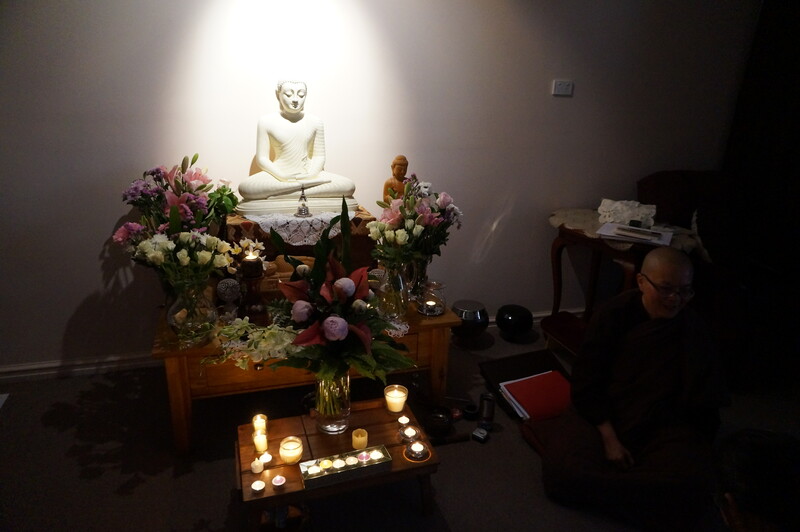 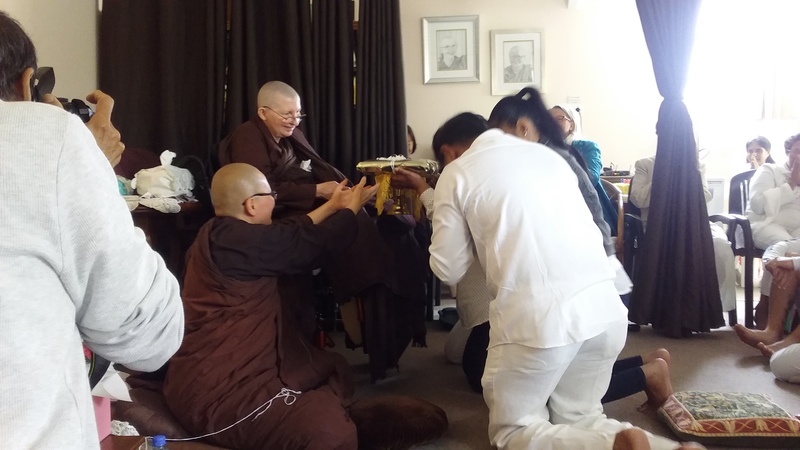 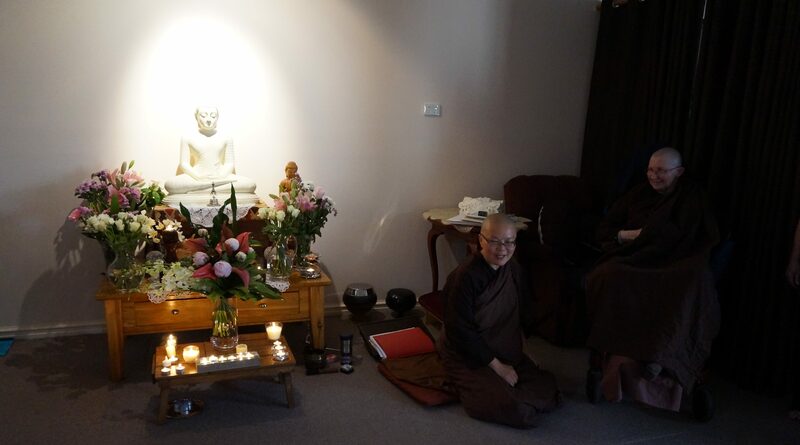 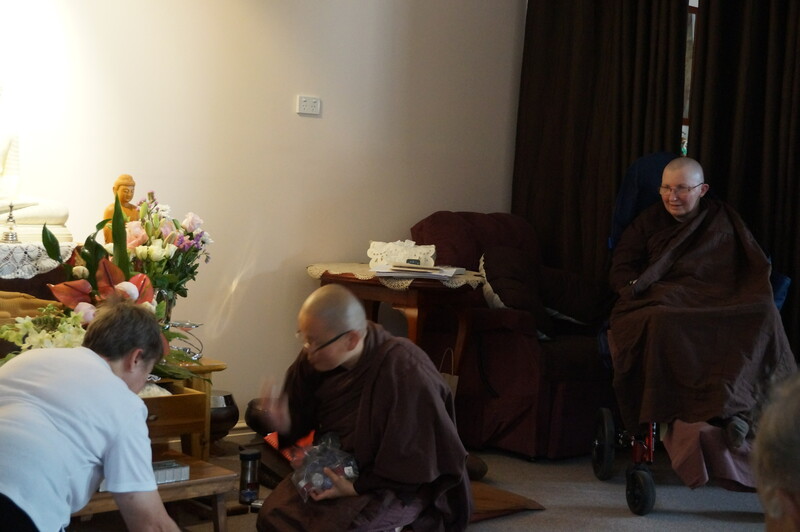 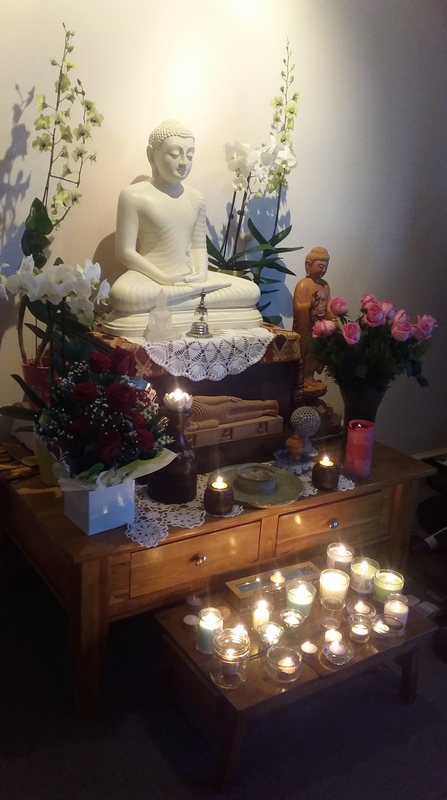 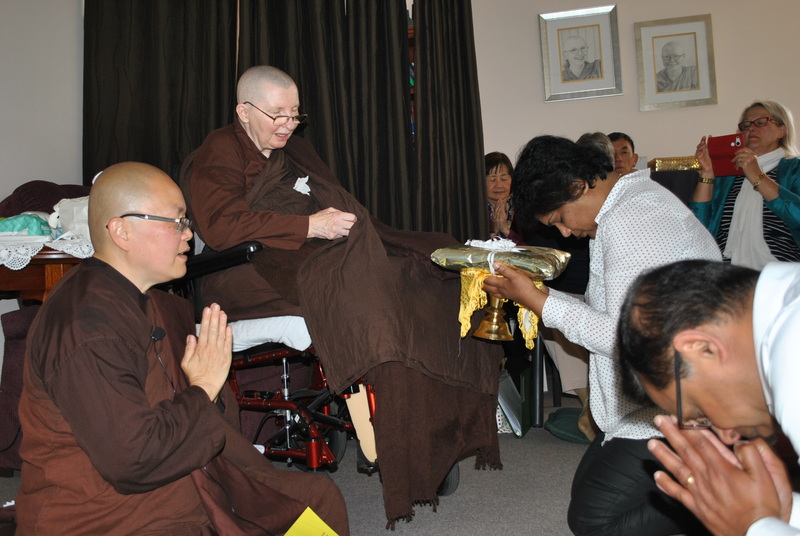 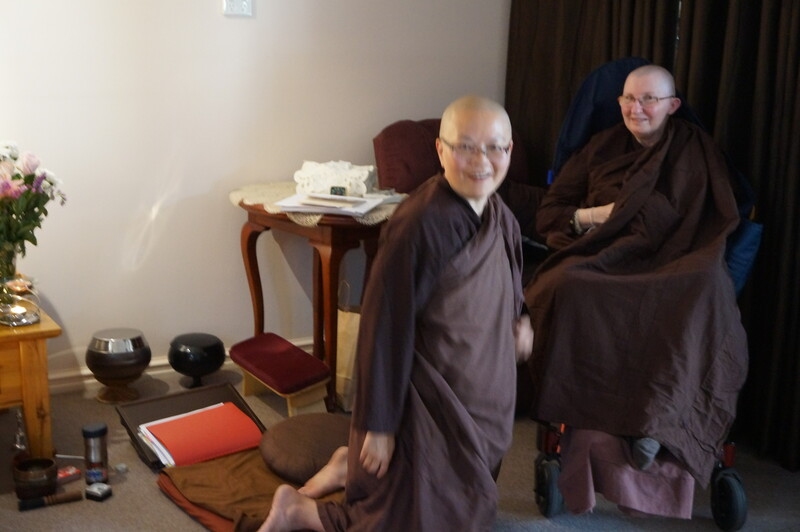 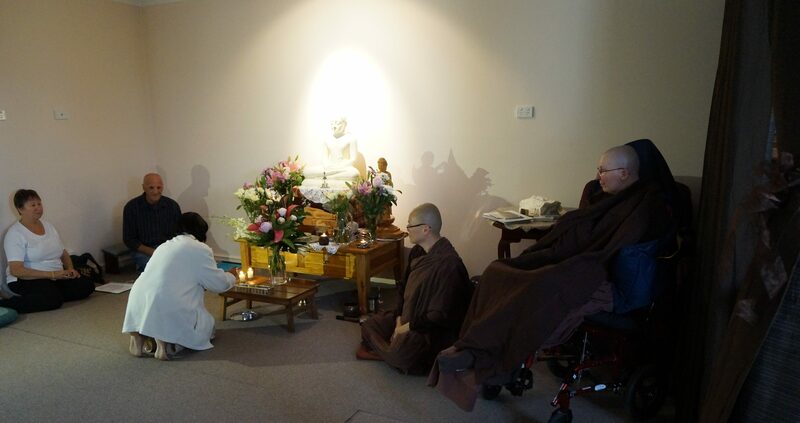 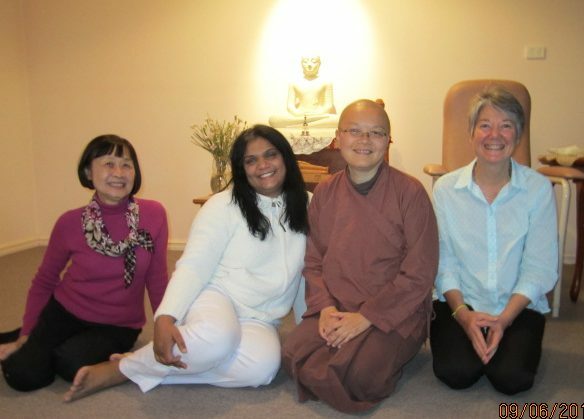 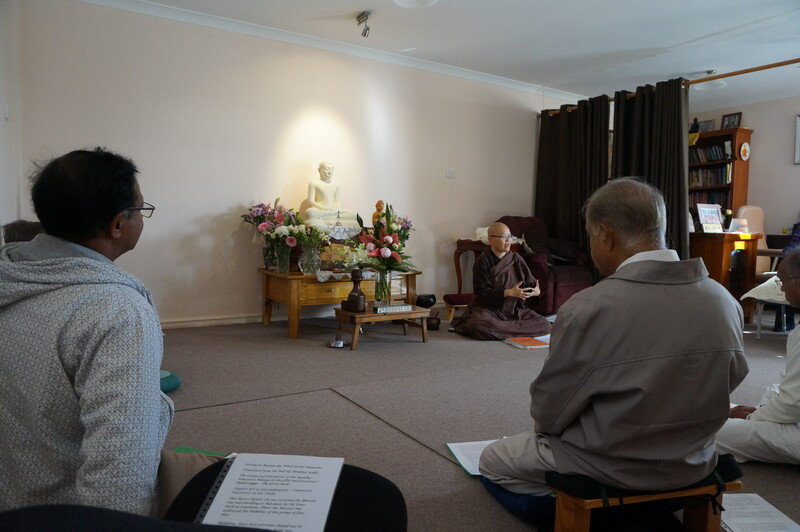 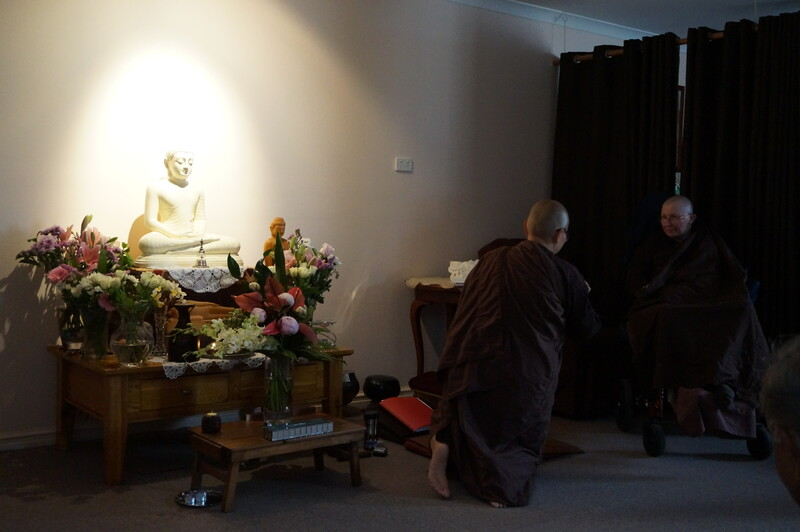 While it is sad to know that Ajahn Vayama now needs 24 hour care, it is with joy that we remember her guidance in all aspects of the Dhamma, which all of us were fortunate to receive and benefit from. 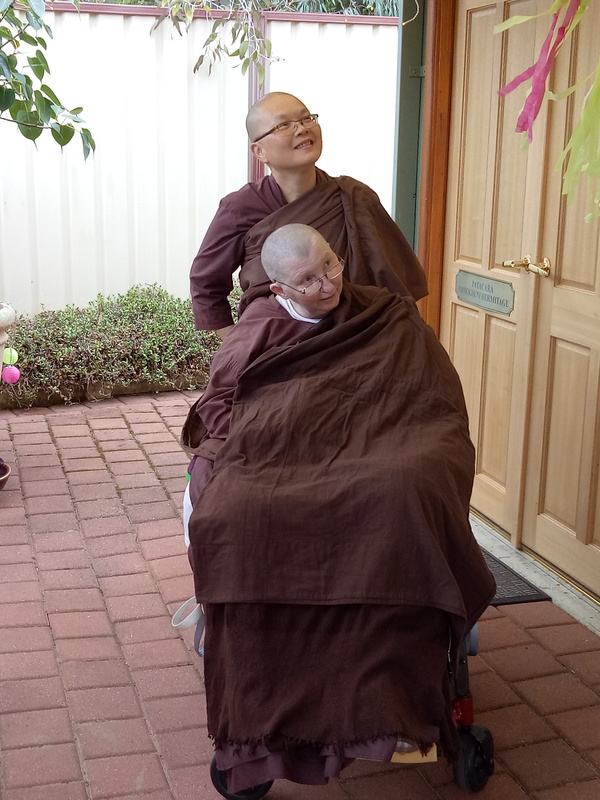 Her wonderful voice in chanting the Loving Kindness Sutra has given us a calmness of mind many a time. 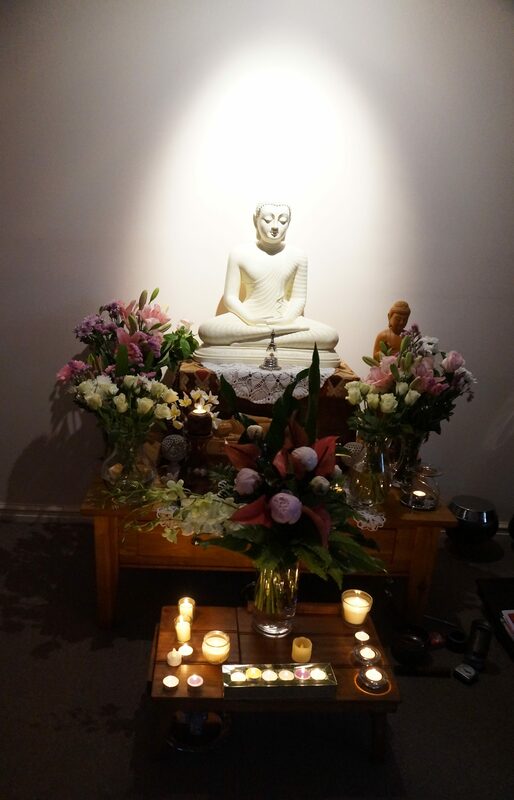 May all that she has done stand her in good stead through this difficult time. 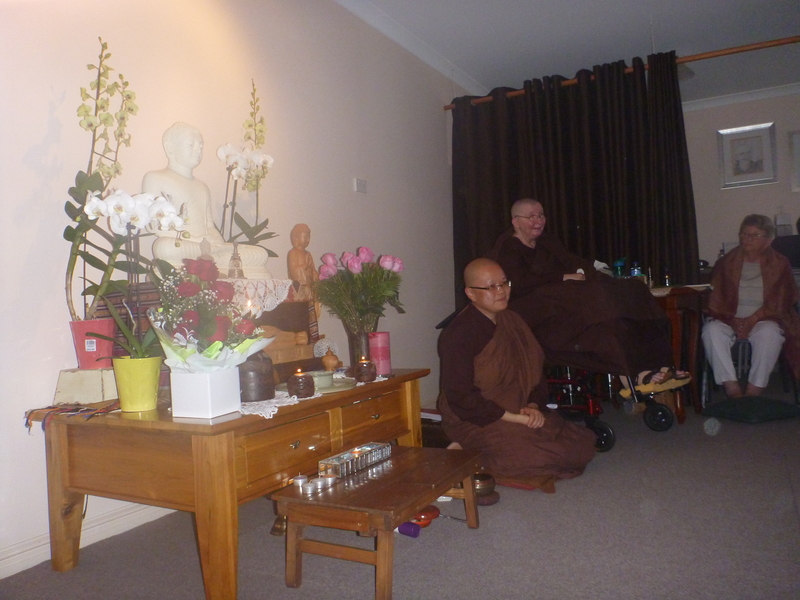 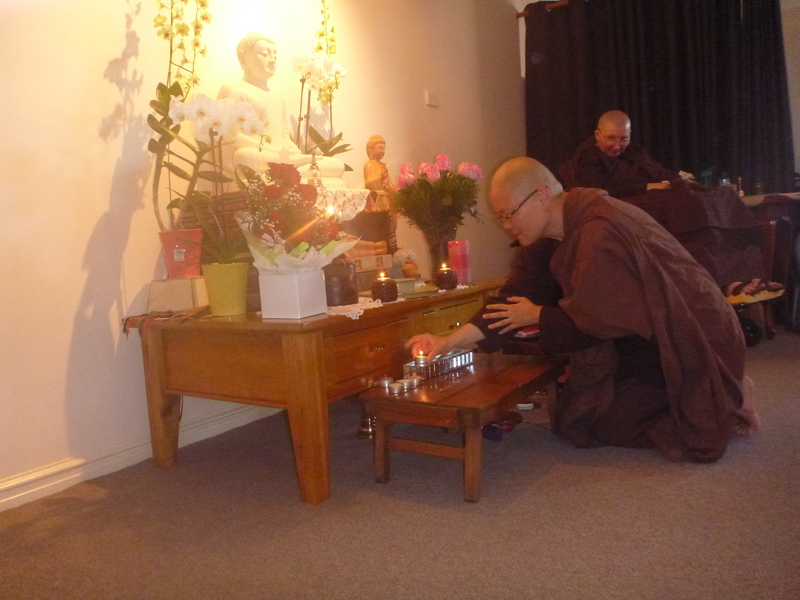 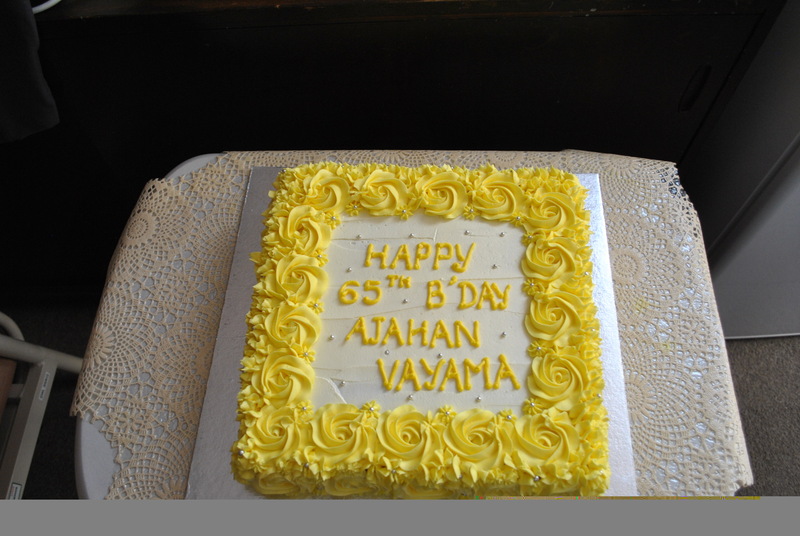 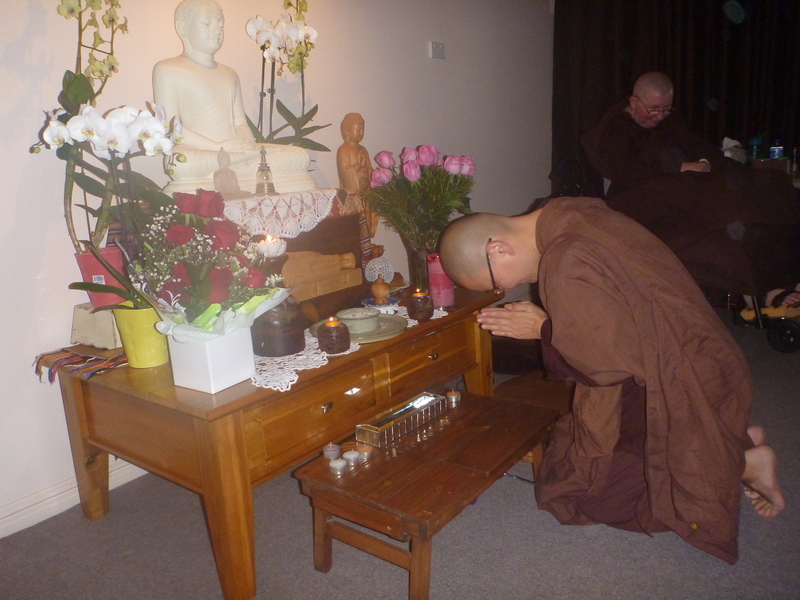 May Ajahn Vayayama be well and be happy in both mind and body. 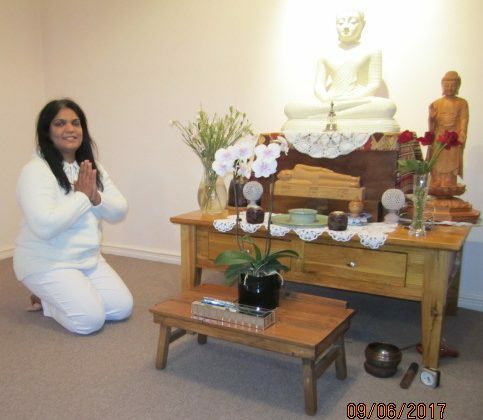 Chandrika Perera pays respect to the Buddha in the Sala of Patacara Bhikkhuni Hermitage before head shaving on 9th June 2017. 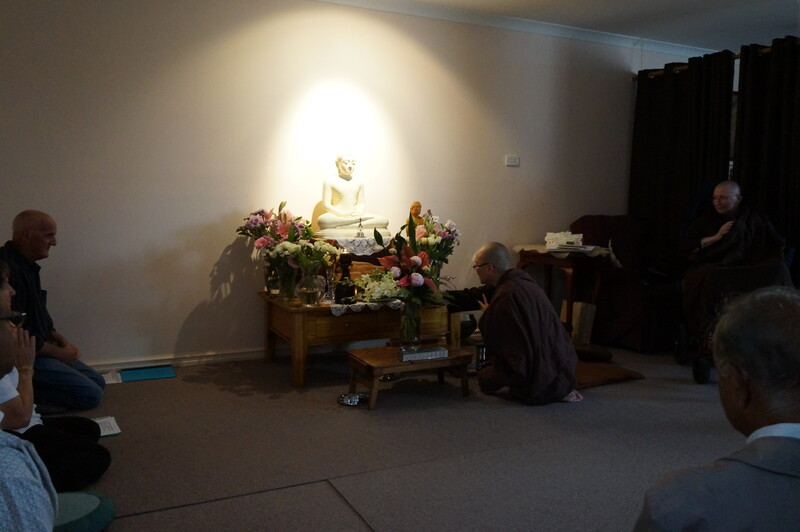 Photo by Ming. 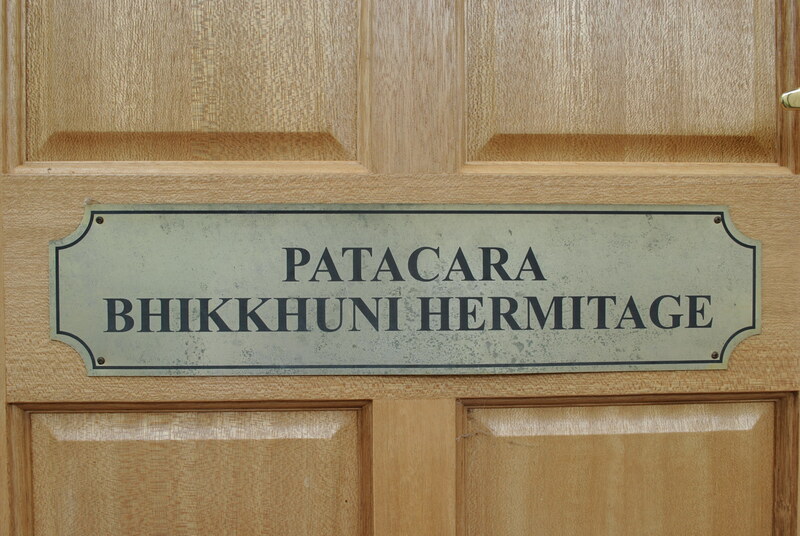 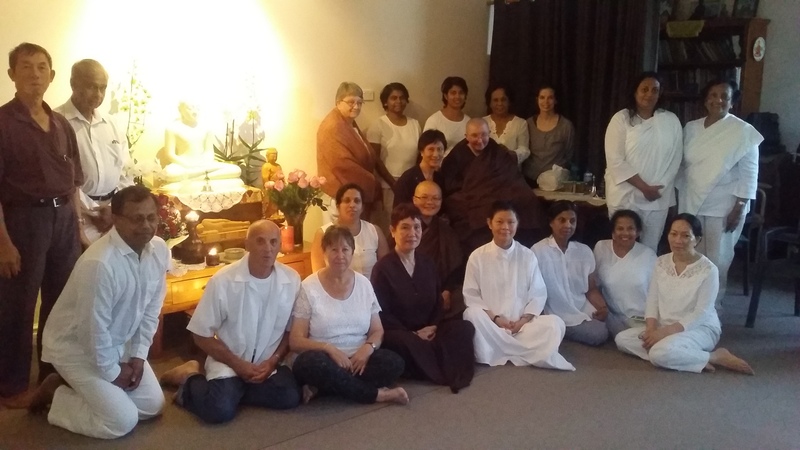 Ayya Seri Bhikkhuni, Chandrika Perera and the committee of Patacara Bhikkhuni Hermitage Incorporated inside the Sala of Patacara Bhikkhuni Hermitage before the head shaving on 9th June 2017. 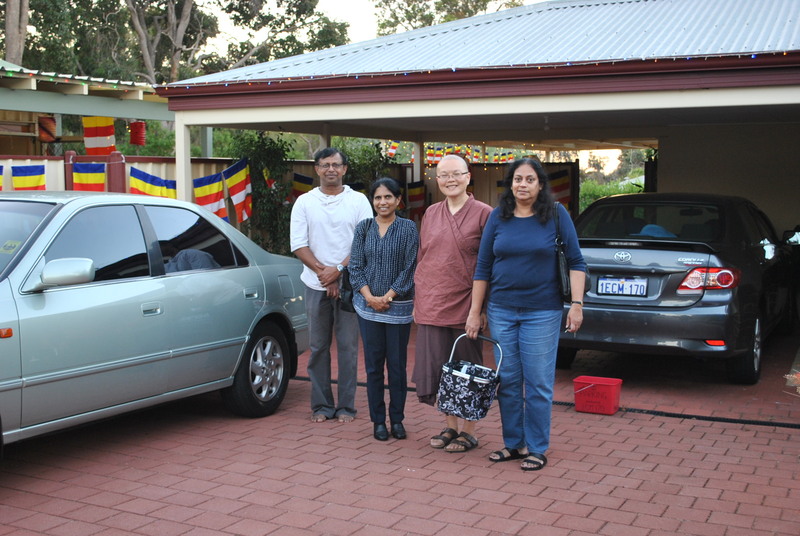 Photo by Mohan. 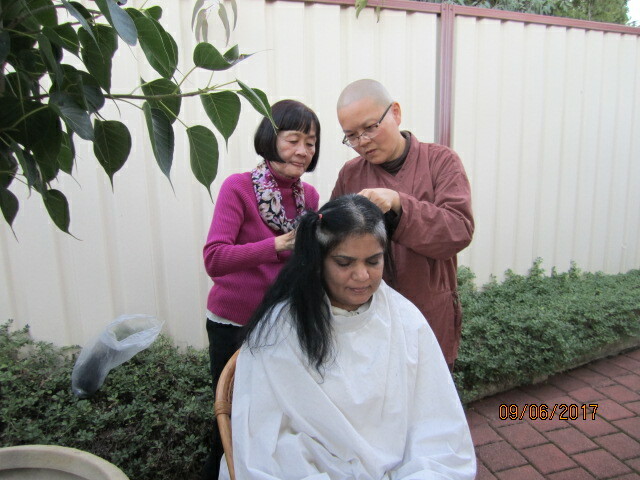 Head shaving under the Bodhi Tree on 9th June 2017 outside the Sala of Patacara bhikkhuni Hermitage. 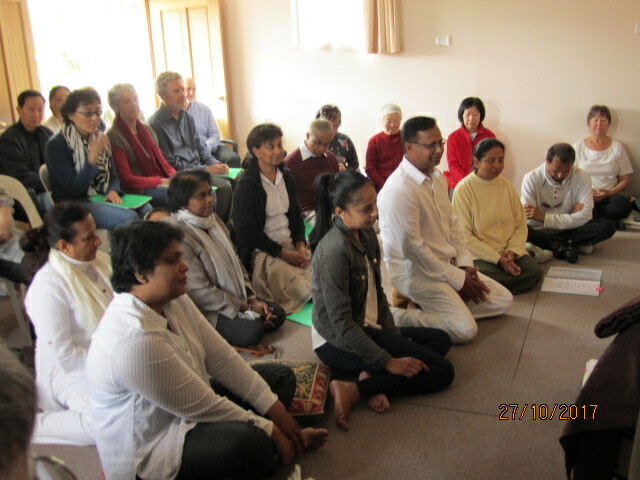 Photo by Mohan. 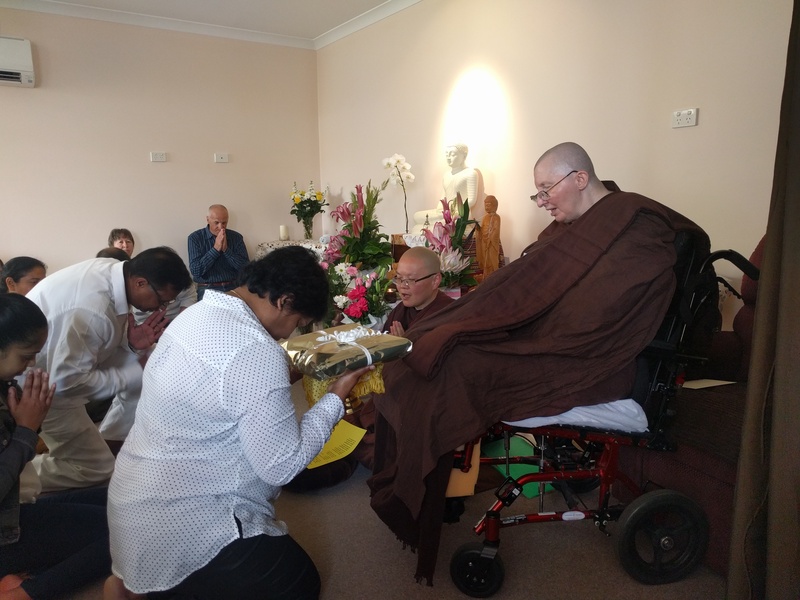 Head shaving of Chandrika Perera by Ayya Seri Bhikkhuni under the Bodhi tree on 9th June 2017 at Patacara Bhikkhuni Hermitage. 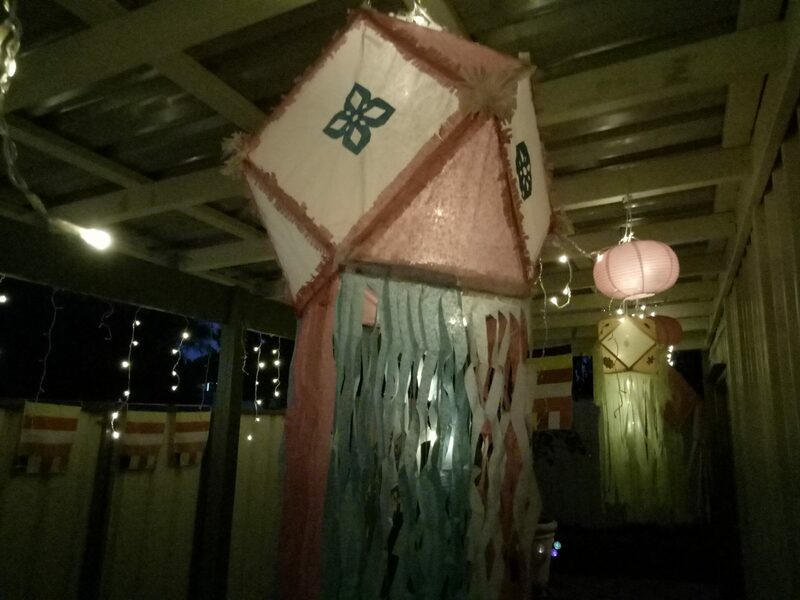 Photo by Ming. 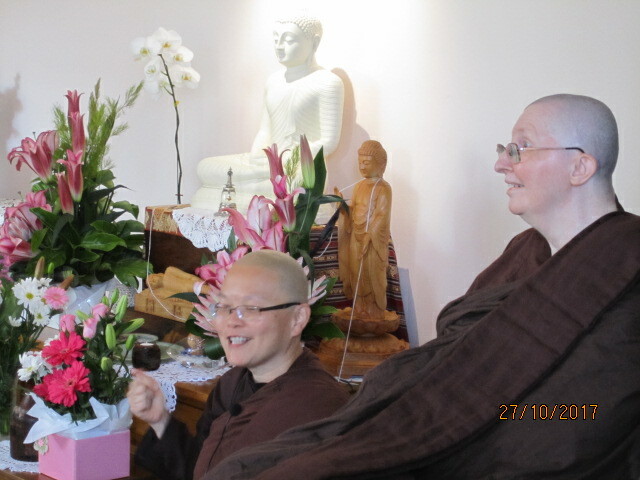 The bright and joyous Chandrika Perera with her hair shaven on 9th June 2017 at Patacara Bhikkhuni Hermitage. 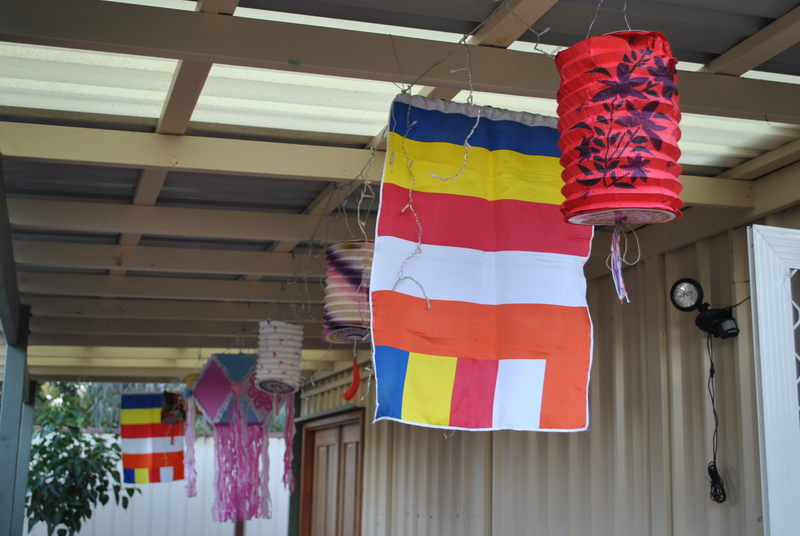 Photo by Ming. 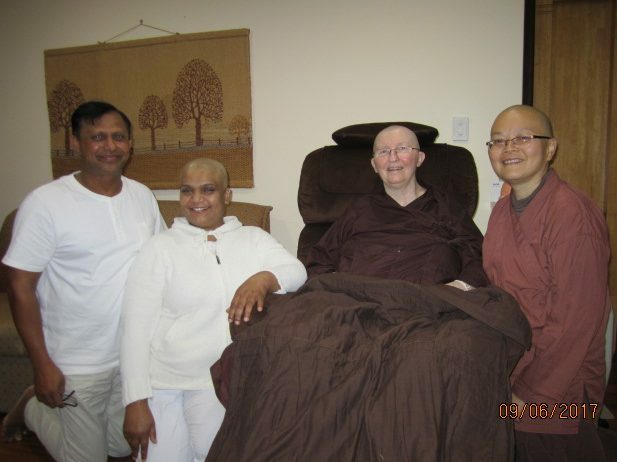 Ayya Vayama Bhikkhuni, Ayya Seri Bhikkhuni, Chandrika and Mohan Perera at Patacara Bhikkhuni Hermitage after the head shaving on 9th June 2017. 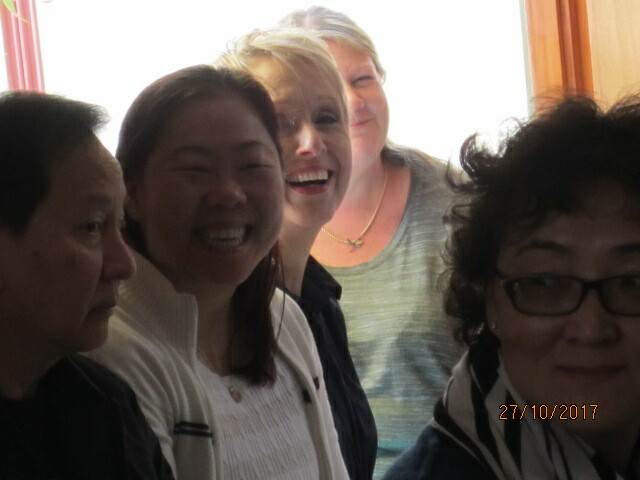 Photo by Ming. 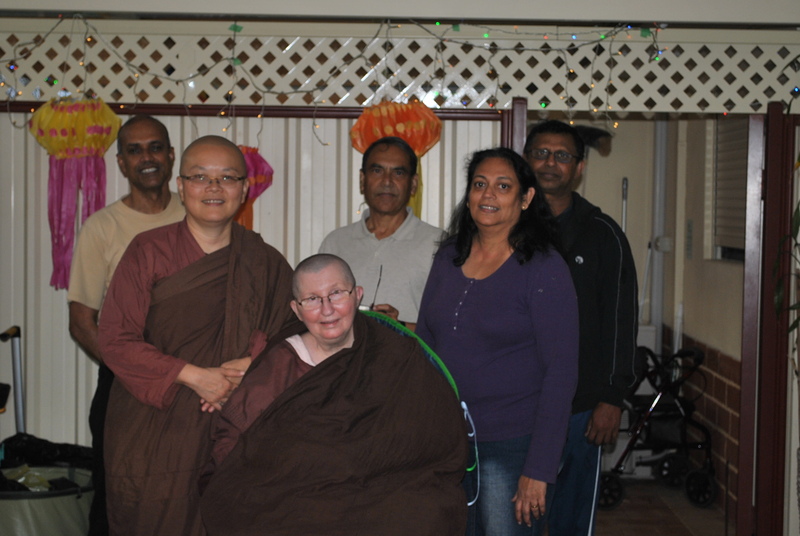 Ayya Vayama Bhikkhuni, Ayya Seri Bhikkhuni, Chandrika Perera and the committee after the head shaving at Patacara Bhikkhuni Hermitage. 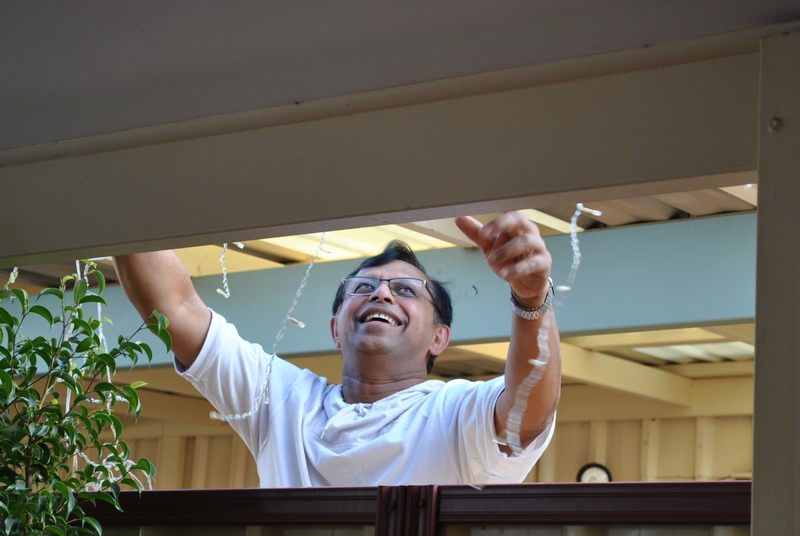 Photo by Mohan.